Photographs taken in Kalamazoo before 1850 are rare. But one enterprising young daguerreotypist from New York thereafter changed the way West Michigan residents saw themselves and their environs. The photographic images captured by Schuyler C. Baldwin between the years of 1851 and 1900 survive to this day as important artifacts, indeed some of our finest examples of how life looked in nineteenth century Kalamazoo. Born in Troy, New York, in March 1822 and raised in Pompton, New Jersey, Schuyler Colfax Baldwin was the grandson of a Revolutionary War hero, General William Colfax, and a cousin of Schuyler Colfax, who would later become vice president during Ulysses S. Grant’s administration. Schuyler Baldwin began his photography career in Troy in 1849, where he operated a second floor studio at 218 River Street. In 1851, Baldwin made the journey westward to Kalamazoo, where his brother-in-law, Dr. Samuel Graves, was a Baptist minister. Upon arrival in Kalamazoo, Baldwin announced he would soon be opening “one of the most magnificent galleries to be found in the Union.” Schuyler Baldwin was to become the first permanent full-time daguerreotypist in Kalamazoo County. In November 1851, Baldwin purchased the “Daguerrean Establishment” of part-time daguerreotypist and jeweler Samuel K. Selkrig, located in the spacious rooms above S. S. Cobb & Co. at 114-116 East Main Street in Kalamazoo. Early photographers depended on an abundance of natural light to illuminate their subjects, so Baldwin was particularly pleased with the gallery’s unique features, especially its “combined northern sky and side light, measuring nearly 200 square feet” (Gazette). Before opening his gallery to the public, Baldwin displayed examples of his work downstairs at Cobb’s store and next door at A. J. Sheldon’s Bookstore. “Mr. B’s pictures have an exquisite clearness and brilliancy,” proclaimed a writer for the Kalamazoo Gazette in late November 1851. “We are glad that so competent an artist has located himself amongst us.” By the end of the month, Baldwin’s gallery was open for business, and customers were lining up, “awaiting their ‘turn to set’ [sic]” for a once-in-a-lifetime artistic portrait. Baldwin was an unusually mobile individual; he never married. Early advertisements made it clear that he intended to establish a permanent operation in Kalamazoo, yet he still ventured back to his “extensive gallery” in Troy nearly every summer throughout his lifetime. Baldwin often returned to Kalamazoo with new equipment and updated techniques that allowed him to further his craft. In 1851, Baldwin advertised a “new German instrument” made “expressly for copying Daguerreotypes and paintings.” A year later, he announced that he had returned from New York with “many valuable improvements in the art” (Gazette). The scope of Baldwin’s work varied considerably throughout his career, and the quality of his work progressed as new innovations in photography came about. By nature, daguerreotype portraits required exceedingly long exposure times—often several seconds to a minute or more, which meant that his subjects had to sit perfectly still for excruciatingly long periods of time. By employing the latest processing techniques, however, Baldwin confidently advertised that he was able to offer “pictures of superior excellence,” including images of infants “in two to five seconds.” Baldwin even offered to record “likenesses of the sick and dead at their residence,” something that perhaps seems morbid by today’s standards, but was a common practice in the mid-nineteenth century. Baldwin’s lens not only captured “the beauty and fashion of the town” in fine contemporary portraiture, but his work featured a variety of subjects that ranged from local street scenes and buildings, to portraits of Native Americans, to scenes in Northern Michigan hunting camps, to wintertime views of Niagara Falls. “Remember, any person of ordinary ingenuity can learn in one day to take pictures, but it requires years of experience to take and finish them so they will remain forever unchangely bright. —S. Baldwin. 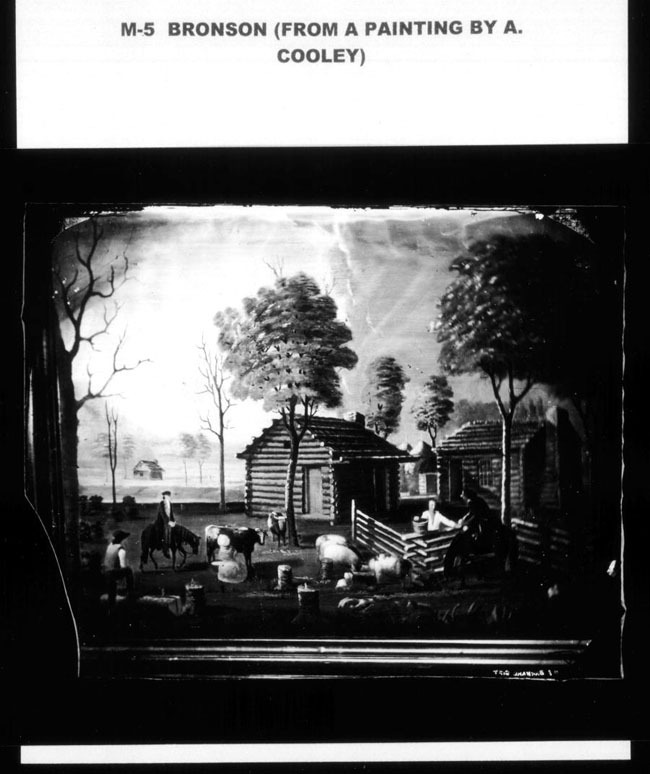 But his practice of supplying transient photographers backfired a bit when a traveling daguerreotypists named S. W. Bryan settled in Kalamazoo and began to offer services similar to Baldwin’s, only “a little cheaper.” Not to be outdone, Baldwin hired H. A. Wallace and deployed “Baldwin’s Daguerreotype Car,” a horse-drawn wagon with a daguerreotype studio on board. During the spring of 1854, Wallace offered daguerreotypes “taken in Baldwin’s Car” at prices “the same as those of inexperienced operators.” In spite of his competitors’ advances, Baldwin consistently advertised “cameras, stock, and chemicals always on hand for traveling artists” (Gazette). Kalamazoo Gazette, 31 October 1856, p. 4. Baldwin returned to New York during the summer of 1854 and left Wallace in charge of his Kalamazoo operation, along with operator James E. Selkirk. Wallace remained with Baldwin for another year or so before resigning in the spring of 1856. Baldwin then hired Elmer A. Boughton and began offering ambrotypes, the latest innovation in photography and considerably less expensive to produce. 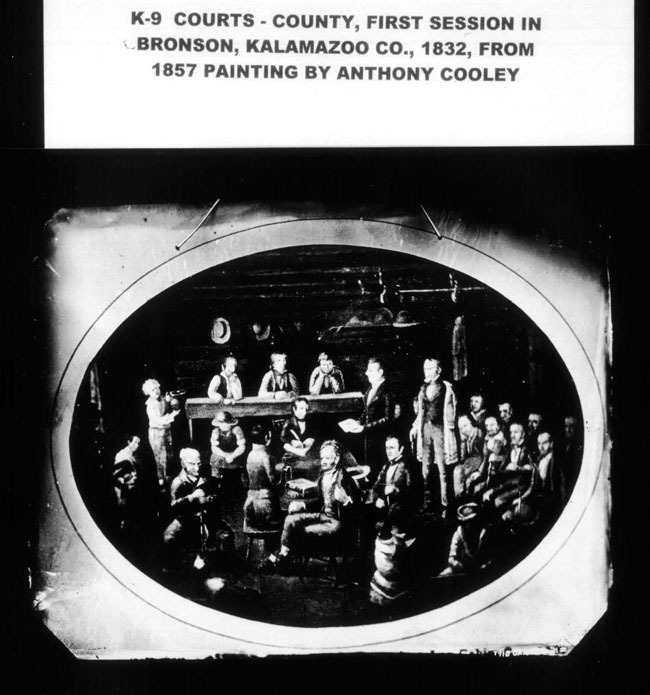 Baldwin and Boughton displayed daguerreotypes at the 1856 Kalamazoo County Fair and won first premium, but their customers were by then beginning to favor the less expensive ambrotypes. By the time the 1857 Kalamazoo County Fair rolled around, Baldwin had discontinued taking daguerreotypes altogether and instead exhibited a fine collection of ambrotypes. Once again, Baldwin was awarded a first premium. Soon, tintypes and paper photographs replaced the earlier processes. By the end of the decade, “a dozen large photographs” could be had at “Baldwin’s Premium Gallery” for just $6.00. According to Baldwin, “old pictures of deceased friends [could be] enlarged into photographs, life size if needed, and painted with water or oil colors” (Gazette). Baldwin reminded his customers that he had “for eight successive years received the first premium for the best pictures taken in Kalamazoo” (Gazette). Elmer Boughton remained with Baldwin until about 1860, while Baldwin continued to claim first premium awards at the Kalamazoo fair; first premium for best photographs in 1860, and best ambrotype and best photograph in 1861. The fair was canceled in 1862 “on account of the war troubles and the consequent disturbance, especially among the farmers of the county” (Gazette). When the draft call came the following June, Schuyler Baldwin dutifully registered, along with numerous other local men between the ages of twenty and forty-five. Baldwin was forty-one years of age at the time and single, though the full extent of his active military service (if any) and subsequent participation in the Civil War is not known. After employing various photographers during the decade that followed, including H. S. Prior (1864-66) and Calvin S. Montague (1867), Baldwin returned to Kalamazoo in June 1868 after an extended stay in New York fearing that he had “neglected his business.” Baldwin issued a public apology for leaving it “in the hands of unskillful operators,” then announced a new association with Edgar H. Perry and Gayton A. Douglas, “men both favorably known as operators of enlarged ideas and experience in the art.” Baldwin promised that “henceforth none but the most skillful [would] be employed” (Kalamazoo Daily Telegraph). By the end of the decade, Perry and Douglas were operating the Main Street studio on their own, and Baldwin was conducting business out of his Academy Street residence. Perry later sold the old gallery at 114-116 East Main Street to Wallace S. White, who would lead Kalamazoo’s “next generation” of local photographers. As time progressed, Baldwin’s interests shifted away from portrait work and more toward architecture and landscape photography. He solicited work from those who wished to preserve views of “public buildings and gentlemen’s residences in this town or country,” and promised they would be “photographed in the highest style of the art” (Gazette). Stereoscopic photography came about during the 1850s and became especially popular after the Civil War. During the late 1860s and 1870s, Baldwin captured hundreds of stereoviews of Kalamazoo, Saugatuck, Grand Rapids, and other surrounding communities. Admired for their uniqueness and clarity, Baldwin’s images are highly sought after by private collectors, although numerous examples do exist in various institutional collections. Holdings of Baldwin’s photos are found in the New York Public Library, University of Michigan’s Bentley Historical Library, Clarke Historical Library at Central Michigan University, Detroit Public Library’s Burton Historical Collection, Grand Rapids Public Library, Kalamazoo Valley Museum, Western Michigan University Archives and Regional History Collections, and of course, Kalamazoo Public Library. During his later years, Baldwin relished the game of croquet, while he continued to capture compelling photographs of life in West Michigan. Among his most captivating images are a splendid series of views taken at the Kalamazoo Psychiatric Hospital (Michigan Asylum for the Insane) and numerous photos of Bronson Park. In 1870, Baldwin’s sister Mary and her husband, Dr. Samuel Graves, returned to Michigan where Dr. Graves became the pastor at Fountain Street Church in Grand Rapids. Between 1870 and 1900, Baldwin visited his sister’s family often and photographed the Grand Rapids area extensively. Mary’s son, Dr. Schuyler Graves, became a physician in Grand Rapids and tended to his uncle’s late-in-life medical needs. Long recognized for his ability to accurately reproduce photos and other works of art, Baldwin was enlisted in 1889 to photograph a pair of important local paintings for display in Arnold VanLoghem’s Kalamazoo art gallery. Painted by Kalamazoo resident Anthony Cooley in the 1850s, the two paintings depict Kalamazoo (then Bronson Village) as it appeared when it was first established in 1832. One image shows Titus Bronson’s log cabin and an early log courthouse, while the other illustrates the first court session held in Kalamazoo in October 1832. Both feature many of the important faces that helped establish the Kalamazoo community—Cyrus Lovell, Bazel Harrison, Titus Bronson, and others; all of whom were said to be easily recognizable to the remaining early settlers who were still living at the time. Baldwin’s photographs offered many locals their first glimpse at the historic paintings and helped to preserve those images of local frontier life for future generations. In the spring of 1891, Baldwin indicated that he intended to release a book of photographs later that same year featuring “Kalamazoo houses and scenes, including 24 pictures which will be a gem of art” (Gazette). Unfortunately, it seems that a book solely devoted to Baldwin’s work has yet to be published. Although uncredited, it does, however, appear that several of Schuyler Baldwin’s photos were used for Kalamazoo Illustrated, a book published locally by Ihling Brothers & Everard in 1892. It is also highly likely that photos taken by Baldwin were included (again uncredited) in Art Work of City of Kalamazoo, published in twelve parts by the W. H. Parish Publishing Company of Chicago in 1894. Schuyler Baldwin remained an independent photographer in West Michigan until his death on 11 August 1900 at the age of 78. He is buried in Valley City Cemetery, Grand Rapids. Currently, Baldwin’s (later Wallace White’s) studio space on East Main Street (now Michigan Avenue) is included in a multi-million-dollar redevelopment project, scheduled for completion in 2012. Special thanks to Lynn Houghton at the Western Michigan University Archives and Regional History Collections for additional information about the Schuyler Baldwin, Dr. Samuel Graves, Mary (Baldwin) Graves, and their family. History Room Name File: Baldwin, Schuyler C.
Books in the KPL collection and other related information. One of Kalamazoo’s most noteworthy early photographers.